Sixth seed Filipino Grandmaster Oliver Barbosa ensured a thrilling end to the 10th Parsvnath International Open Grandmasters Chess Tournament by defeating Indian International Master Shyam Nikil in the eleventh and final round at Ludlow Castle Sports Complex here on Monday. This victory enabled Barbosa to take his tally to nine and half points to take the Winner’s trophy and pocketed a cash prize of 2 lakh rupees. 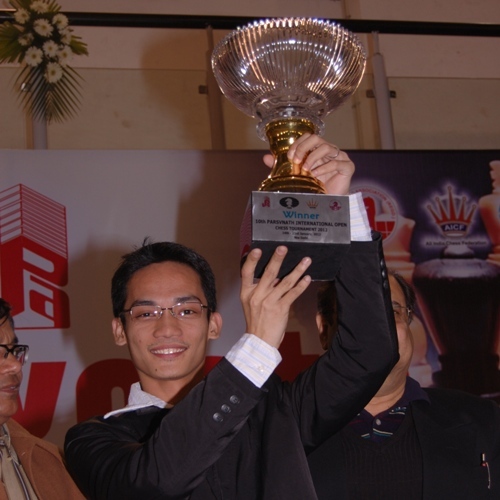 Grandmaster Gomez John Paul of Philippines and Indian International Master Lalith Babu tied for the second spot with nine points but better tie-break score helped Filipino Grandmaster to finish second while Lalith satisfied with third spot finish. In the final round, Lalith outwitted International Master K Rathnakaran while Gomez drew with Ma Qun of China. Ma Qun secured International Master norm during the process. Dr. P C Kashyap, Executive Director Sport Authority of India along with Shri. Bharat Singh Chauhan, Hony Secretary AlCF and Shri. 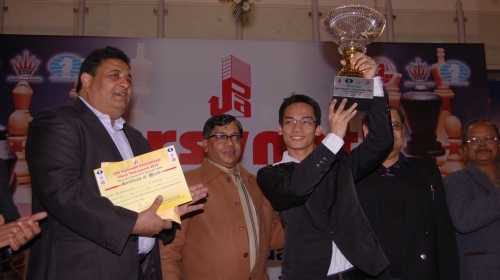 Sunit Sachar, Parsvnath Developers gave away the prizes in a colourful closing ceremony. Full standings with 304 players are posted bellow.